The power exchange in Leipzig, Germany, has published a position paper on the Energiewende in German. Craig Morris sums up the main points. The European Energy Exchange (EEX) is based in Germany, but the German and Austrian grids are basically inseparable nowadays, and the grids in Benelux countries, Switzerland, and France are also increasingly woven with Phelix, as the Austria-German grid is known. In its new position paper (PDF in German), the EEX therefore focuses on the “two dimensions of the ‘market’ and ‘Europe’” in proposing changes to power market design. The paper makes eight proposals, not all of which can be discussed here. I’ll start with the charge that “sticking to national energy independence” is the wrong path – a comment that increasingly looks outdated the more Germany intensifies cooperation with its neighbors. The main focus is on protecting competition, an obvious proposal from the folks who would lose their jobs if there were none. Unsurprisingly, the position paper opposes capacity mechanisms as “yet another subsidy” and more government intervention in markets; instead, they would like to see demand management and European integration promoted instead. Essentially, the EEX wants to power consumers to receive price signals that encourage them to shift loads – an option that is currently being discussed as an option within a capacity market, which the position paper does not mention. For renewables, the EEX would like hybrid compensation for renewables: basic compensation at a lower rate than under current feed-in tariffs along with the price on the exchange when green power is sold. The idea is nothing new; Spain has had a similar combination for wind power for years, and similar proposals have become common in Germany in the past few years. The idea is that there would be “label” for green electricity; yet, one already exists for retail consumers. The EEX basically wants a separate market: “Consumers who are willing to pay more to cover the cost of renewables could then do so” – an option that already exists. After all, all German retail consumers have been able to switch power providers, including to a 100 percent green provider, for more than a decade. 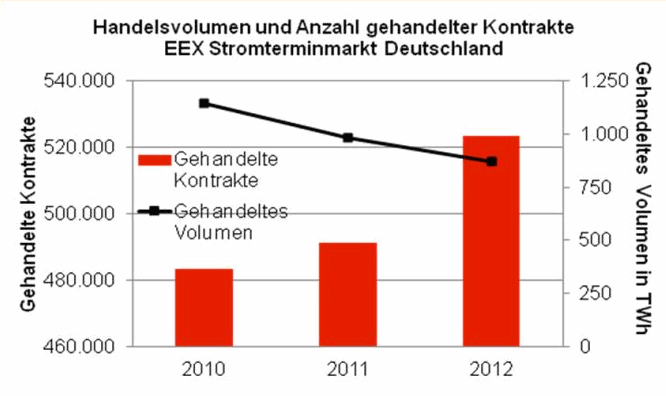 Direct sales of green power would “reduce the renewables surcharge.” But as I once tweeted to German Environmental Minister Peter Altmaier, the level of this surcharge does not matter; if it makes up 100 percent of the retail rate, but the retail rate drops, no one will complain. Finally, the EEX would like to see a European carbon emissions target for 2030 – and again, the EEX is a trading platform for emissions allowances. But admittedly, we need a higher carbon price. In short, the proposals stem from the organization’s own business plan. Nonetheless, they seem reasonable enough and are within the mainstream of current debate. Perhaps the most interesting passages are those made on the side, such as the comment that the energy market is “flying by sight” because of the recent shift in power production since Germany shut down 40 percent of its nuclear capacity in March 2011. Long-term trading has dropped – to the benefit of monthly and weekly contracts. In other words, the business community does not know what to expect and cannot plan. A call for longer planning horizons and more reliable policies seems justified.